When planting a butterfly garden, consider the entire life cycle of the butterflies you hope to attract. With only nectar plants, you'll get your share of foraging adults on your flowers. But when it comes time to lay eggs, the butterflies will head for greener pastures, so to speak. A true butterfly garden provides food for the caterpillars, too. Choose plants that feed the most species, and you're really increasing the biodiversity in your backyard. If you garden in the U.S. or Canada, these 10 powerhouse perennials will support a surprising number of native butterflies and moths. Ranking first on the list of powerhouse host plants, goldenrod feeds over 100 different species of native caterpillars. Goldenrod, genus Solidago, also provides adult butterflies with an excellent source of nectar, giving you even more bang for the butterfly garden buck. A lot of people steer clear of goldenrod, believing it brings hay fever with its blooms. This is an unfortunate case of mistaken identity. Goldenrod looks similar to the allergy-triggering ragweed, but won't have you reaching for the antihistamines. Caterpillars that feed on goldenrod include the asteroid, the brown-hooded owlet, the camouflaged looper, the common pug, the striped garden caterpillar, and the goldenrod gall moth. Asters come in a close second on our list of native caterpillar food plants. Plant asters (genus aster) in your butterfly garden, and you'll attract any number of the 100-plus Lepidopteran larvae looking for this host. As an added benefit, asters bloom late in the season, giving migrating butterflies a much-needed energy source when other flowers are past their prime. Which caterpillars feed on asters? Lots, including larvae of pearl crescents, northern crescents, tawny crescents, field crescents, silvery checkerspots, asteroids, brown-hooded owlets, camouflaged loopers, common pugs, and striped garden caterpillars. Native sunflowers are another fantastic food source for caterpillars. Plants in the genus Helianthus provide nourishment to dozens of our native butterflies and moths when they are young. Add some sunflowers to your garden, and you'll also find your yard a-buzz with bees gathering nectar. There are plenty of compact sunflower varieties that work nicely in even the fussiest gardener's flower beds. Sunflowers support caterpillars of the bordered patch, dainty sulphur, silvery checkerspot, gorgone checkerspot, giant leopard moth, and common pug, various haploas, as well as dozens of others. Eupatorium is another powerhouse perennial for butterfly gardeners. You may know it as an excellent nectar source for adults, but it's also the larval food source for at least 40 different butterfly and moth caterpillars. Plants in the genus Eupatorium go by several common names: thoroughwort, dogfennel, boneset, and joe pye weed. Don't think of it as a weed, though, because the butterflies love it. In my book, this one's a "must plant" for any butterfly garden. Among the caterpillars that feed on eupatorium are LeConte's haploa, yellow-winged pareuchaetes, camouflaged loopers, and common pugs. If you want fritillaries in your butterfly garden, you have to plant violets. Violets, genus Viola, feed the caterpillars of over 3 dozen native butterflies and moths. So leave those volunteer violets that pop up in your lawn, and consider adding some perennial Johnny jump-ups to your butterfly garden. Depending on where you live, your investment in violets will yield caterpillars of the regal fritillary, the great spangled fritillary, the Aphrodite fritillary, the silver bordered fritillary, the giant leopard moth, and the beggar, as well as many localized fritillary species. Geraniums rank among the best herbaceous host plants, too, as long as you plant the right kind. In this instance, we're only talking about the hardy geraniums of the genus Geranium, also known as cranesbills. Add some cranesbill geraniums to your garden, and you'll attract any number of the native butterflies and moths who lay their eggs on this host. Hardy geraniums provide food for the caterpillars of the Virginian tiger moth, the mouse moth, and the tobacco budworm, among others. The tobacco budworm caterpillars actually take on the color of their host, so if you plant pink geraniums, you'll get pink caterpillars! Commonly called yarrow or sneezeweed, Achillea feeds about 20 species of butterfly and moth larvae. Sneezeweed gets its name because it was used to make a snuff in the past, so don't let the label stop you from planting it. And as an added benefit, Achillea will attract all types of beneficial insects to your garden, helping keep pests in check. Which caterpillars will you find munching on yarrow? For starters, it attracts camouflaged loopers, striped garden caterpillars, blackberry loopers, common pugs, cynical quakers, olive arches, and voluble darts. And wouldn't it be cool to tell your friends you have cynical quakers in your garden? The big, colorful flowers of hibiscus look great in any flower garden, but these plants are not just for show. Hibiscus, aka rosemallow, feeds dozens of North American caterpillars, mostly moths. Make sure you plant a variety that's native for your area, as exotic species have a tendency to become invasive. Check the foliage below the hibiscus blooms for caterpillars of the io moth, the common hairstreak, the yellow scallop moth, the rose of Sharon moth, and the glossy black idia. Rudbeckia is another great multipurpose plant for the butterfly garden. Plants of this genus include black-eyed and brown-eyed susans and coneflowers, all of which provide excellent nectar sources for butterflies. You might be surprised to learn that these plants also support over a dozen species of caterpillars. Plant any kind of Rudbeckia, and you've invited camouflaged loopers, silvery checkerspots, common pugs, and gray-blotched epiblema moth caterpillars to your yard. No North American butterfly garden would be complete without a patch or two of milkweed, genus Asclepias. Common milkweed, with pink flowers, isn't quite as stunning as the bright orange butterfly weed. 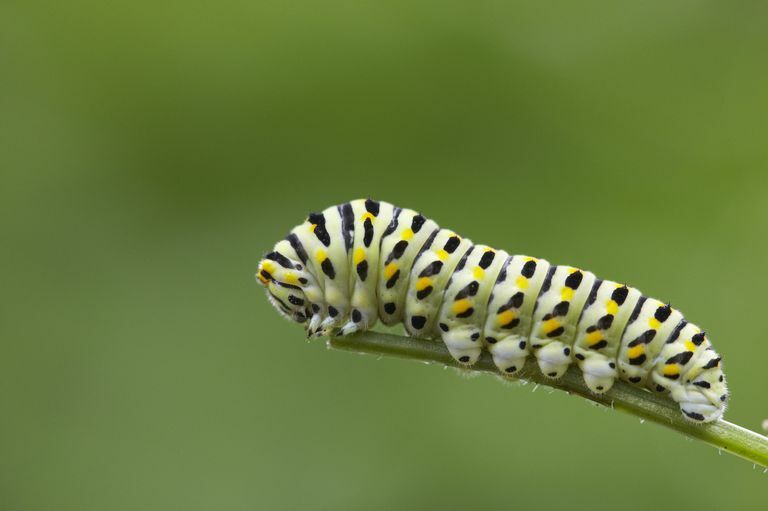 The caterpillars aren't all that picky, though, so choose a milkweed that fits your style. A dozen kinds of butterflies and moths will lay eggs on milkweeds. Milkweed's most famous caterpillar is, of course, the monarch. You'll find more than monarchs on your milkweed, though, as queens, milkweed tussocks, striped garden caterpillars, and 8 other larvae feed on this plant. Does Eating Milkweed Make Monarch Caterpillars Sick? Nope.